1. How to reheat lasagna In the Microwave? 2. How to reheat lasagna In the Oven? 3. How to reheat lasagna in a skillet? I am not greedy. I just like to plan and organize meals that I love. Therefore, I make my favorite lasagna in bulk, eat what I need, and save the rest for later. There is always a special spot in my fridge for the lasagna. I purposely store them in small containers that can hold enough portions for one meal. I suggest using a microwave or oven-safe boxes, so there is no need for you to transfer them to another container during the reheating. 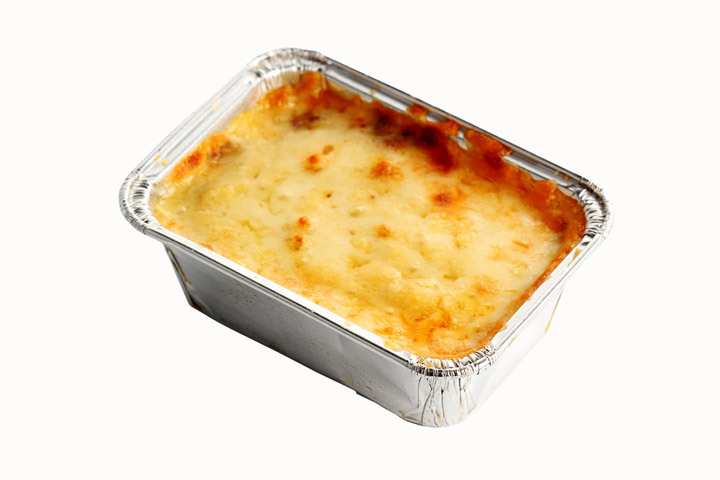 Remember to eat the refrigerated lasagna (leftovers or freshly baked) within 3-4 days. However, if you opt to store it in the freezer, it lasts longer. I have reasons why I keep food this way. To keep my lasagna fresh longer: I can easily take what I need leaving the rest untouched. Air enters the container once you open the stored food. With air inside, the food spoils faster and shortens the shelf life. Save time and effort: It’s troublesome and a waste of time to get a big box of lasagna from the fridge, open the lid, take a small portion, then store again. Keeping it in small containers and arrange them inside. Get one box at a time and reheat. What I like most about pasta is that I can cook it freestyle. It may take a long time making my perfect lasagna but reheating it is a lot easier. Therefore, I make lasagna in bulk and the keep the rest for later. Each method has its own steps of correctly heating your lasagna and prevent it from spoiling. Whatever method you use, it will take an average of 15 minutes to finish. If you are new in using the microwave to reheat lasagna, I advise to start with small portions first one at a time. Sometimes, you will learn your own reheating settings based on your preference. Once you master it, then you can move on to bigger portions. 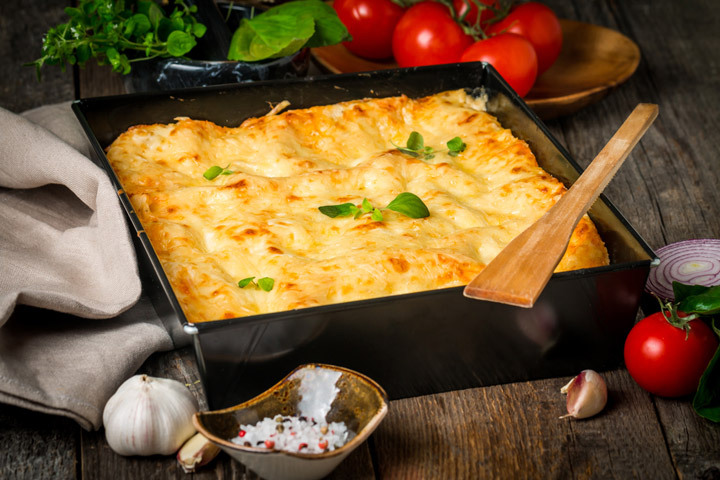 With the small portion of lasagna placed in a microwave-safe container, drizzle a bit of sauce or water on top to keep it moist while reheating. Cover the dish and place it inside the microwave. Defrost first if your lasagna is frozen. If not, then proceed to the next step. Set to medium heat for 1-2 minutes. It should appear to be bubbly once it’s done. Check if the dish is already warm all throughout. If not, heat it a bit longer for about 15 seconds. Serve while it’s still warm! 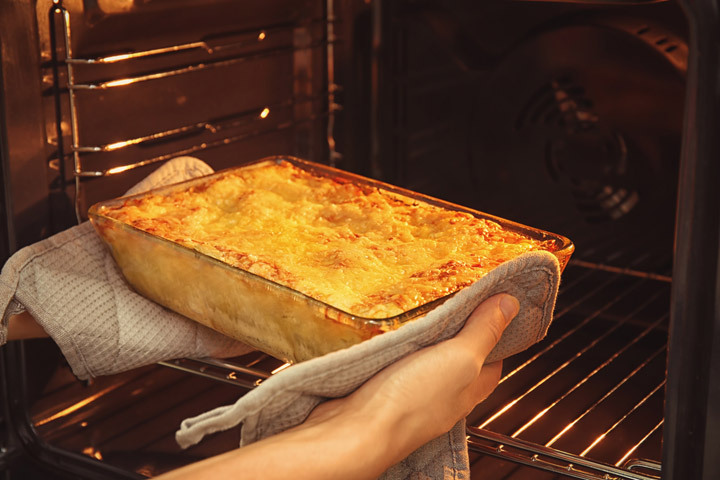 Unlike the microwave, you can reheat large portions of lasagna in the oven. The advantage of using an oven is the even distribution of heat giving the food a freshly baked texture. Transfer it to an oven-safe dish if you have placed it in a different container prior. Put sauce or water for about 2 tbsp. to ¼ cup (depending on the size) on top. Cover the container with aluminum foil. Make sure to seal the edge so as not to let the moisture out and dehydrate the lasagna. Place it in the middle rack in the oven and reheat for 25 minutes. Check if it’s completely heated. It should appear bubbly, and you’ll hear a sizzling sound. If not, you can stick a fork in the middle. If it comes out warm, then it’s done. If you use the meat thermometer, a reading of 165 deg. F would mean it’s done reheating. Take the foil off, leave it inside for 10 minutes. Pull it out and serve! When you don’t have an oven or microwave, what choice left than the skillet? Place the lasagna (thawed) in the skillet. Put it on the stovetop and turn on heat to medium. Pour the sauce or water at the sides of the skillet just to slacken the pasta a bit. Cover the skillet and let it simmer. Cook it for 20 minutes, giving time for the pasta to absorb the sauce. If you like it to be a little crispy, remove the lid and heat on high for the last 5 minutes. Turn off the heat, let it sit for a minute then serve. If you want to try reheating a lasagna, knowing the procedure is not enough. I have some practical factors that you need to keep in mind for a successful reheating. Always put a cover on to retain moisture. 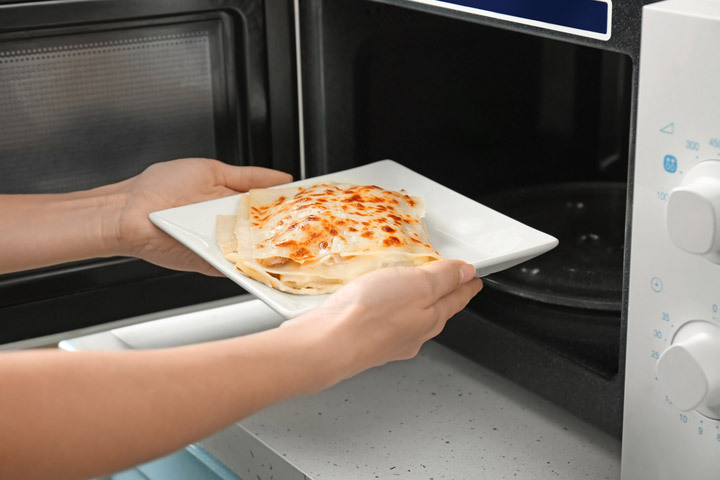 You may use the lid of your microwave-safe container or a sheet of oil when using an oven. Keep a keen eye. Bubbly lasagna is a sign that it’s already heated. If you continue reheating, your lasagna will end up hard and dry. You will get to know how to watch out for food when heating. I learned to stop in between the reheating to check if the temperature is even, take the cover out, and stir to make sure it gets warm all over. Add more sauce or cheese on top of the lasagna 10 minutes before the time is up. It will make your lasagna more moist and savory. I advise to not reheating lasagna more than once. It will appear to be more soggy and dry. Therefore, follow the store, reheat, and consume rule. + Also Check Out: How to Reheat Wings in Five Easy Ways? , How to Reheat Pork Chops in Three Simple Ways? I just can’t get enough with lasagna. For me, it’s comfort food. I’ve learned how to reheat lasagna because of my constant cravings. Do you know that if stored properly, lasagna gets more delicious when reheated? The three ways to reheat lasagna that I mentioned are the most common way of doing it. Yet, others can be more creative by doing it through broiling and grilling. How to do it is not much of an issue. What matters is that the lasagna comes out delicious for a warm meal. It retains its rich taste and soft texture. Can you share with me your own method of reheating lasagna? Drop your comments and let’s talk about it.